A slighly brown man in faded orange drapes wearing white bathing shoes stepped out of a compact car yesterday and into the Butler YMCA to attend a meeting. 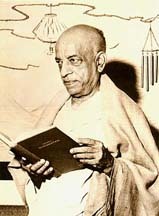 He is A.C. Bhaktivedanta Swamiji, a messenger from India to the peoples of the West. He believes that the highest possible state will be to go to God, or eternal life.